Russell Zeiss attended Daemen College class of 2014 and earned his Doctor of Physical Therapy Degree. Russell pursued his undergraduate studies at SUNY Buffalo and earned his bachelor of science degree in Exercise Science in 2011. He began working for Ivy Rehab Physical Therapy in October 2015 as staff Physical Therapist and was promoted to clinical director of our New Rochelle location starting in November of 2016. Russell evaluates and treats all musculoskeletal pathology in the spine and extremities. Russell's specialty interests are in McKenzie Method for the spine and extremities. Carly attended Ithaca College, earning her Bachelor of Clinical Health Studies (B.S.) degree in 2012 and Doctorate of Physical Therapy (D.P.T.) degree in 2014. She evaluates and treats all patients presenting with musculoskeletal pathologies, including pre- and post-operative conditions, as well as a wide range of orthopedic conditions. Carly has been a Certified Kinesio Taping Practitioner (CKTP) since 12/2017. 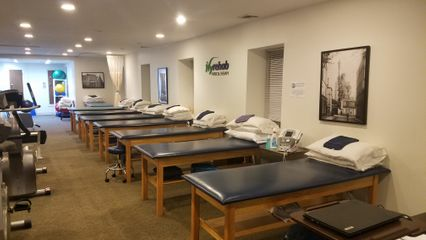 Areas of interests include manual therapy, sports-specific training, and working with Iona College Division I athletes. Jennifer attended Iloilo Doctors College in the Phillipines and earned her Bachelor of Science degree in Physical Therapy in March of 1999. She is also currently working towards obtaining her Doctorate of Physical Therapy degree. In addition to working with the general outpatient orthopedic population presenting with musculoskeletal pathology and post operative conditions, Jennifer pursues the majority of her continuing education in geriatrics. Jen has been working for Ivy Rehab Physical Therapy since 2006, and was promoted to Senior Physical Therapist in 2016.